Home » Service Komputer » Notebook LCD Broken, It Can Do Repair? Notebook LCD Broken, It Can Do Repair? Notebook LCD Broken, It Can Do Repair? - LCD (Liquid Crystal Display) is a part on a notebook that is very easily damaged. If the notebook LCD damaged or broken, it must be replaced with a new LCD. 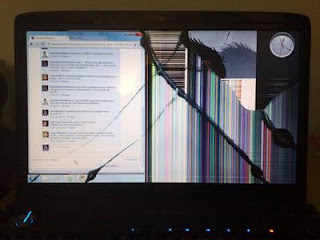 If damage on the laptop LCD is not severe, of course, still be able to perform repair technician. Examples of damage is on the notebook LCD back light, whereby if a part is damaged then it can be replaced with a new back light, but to get the back light spare parts are still hard. There are not many places that provide back light spare parts, unless the previous order.